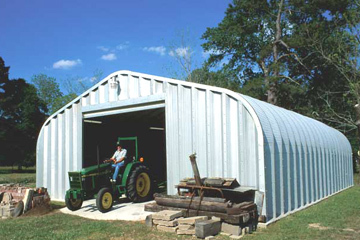 If you’ve invested heavily in your farm equipment and you need a sturdy storage building to protect your hard-earned belongings, let U.S. Buildings provide a custom solution for your equipment storage needs with one of our steel storage building units. Choose from our prefabricated designs or design your custom building, so that you can rest easy knowing your equipment is protected from theft and harsh weather elements. Instead of choosing a traditional pole building kit that will rot over time, go with a U.S. Buildings solid steel metal storage building, and enjoy the option of adding doors and windows to make it your own. Give us a call today to learn more about our affordable steel storage farm buildings that are up to 60% off of conventional brick, block or wood building costs.